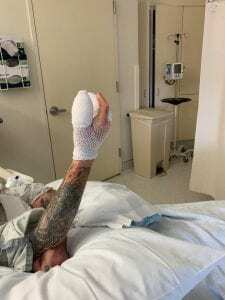 Ozzy Osbourne was forced to cancel three shows on his current ‘No More Tours 2’ trek after suffering from an infection that led to hand surgery. Last week, the Prince of Darkness announced that he would reschedule his October 6 show at the Shoreline Amphitheatre in Mountain View, California to October 16. Osbourne was expected to remain at Cedars-Sinai hospital in Los Angeles for a few days following the medical procedure, a press release stated. The singer announced yesterday that he would be postponing two addition shows as he takes a few extra days to recover. The October 9 show in Chula Vista, California has been moved to October 18, and the October 11 gig in Los Angeles will now take place on October 15. Additionally, the Mountain View concert scheduled for October 16 has been rescheduled again, now due to take place on October 20. While tickets will be honored at the rescheduled dates, Live Nation said that ticket holders can receive refunds at their point of purchase. Osbourne’s next show will take place at Las Vegas, Nevada’s MGM Grand Arena, which is followed by the three rescheduled show dates. While Stone Sour will open the show in Vegas, he is unable to perform at the newly-announced gigs. A new supporting act will be announced shortly. Starting next January, Osbourne will play the European leg of the tour with Judas Priest. The jaunt, which will make stops in the UK, Germany, Sweden, Finland, Switzerland, Italy, and Spain, will run through March 2019. Although ‘No More Tours 2’ is supposedly Osbourne’s last tour, he is still expected to play shows once the tour ends. Check out Osbourne’s upcoming tour dates below.